This is my birthday girl. I don't like to admit it to myself, but she is now eight years old. That means I have roughly one decade left to tuck her into bed at night and listen to her practice violin and to make sure she at least tries the vegetables on her plate. It's like trying to hold tight to a handful of water; you can feel it slipping through your fingers before you get a solid grasp. I like to tell her that I will smash the clocks and throw away the calendars so she won't get any older, but she just rolls her eyes. She's old enough to know how ridiculous that is, even if her mother is silly enough to try it. (It almost worked for Frog and Toad.) Besides she was born old. And smart, too. It's tough to be in charge around here. Three of my sisters have little May birthday girls too, and so it was decided to have a quadruple cousins birthday party with a Max and Ruby theme. Do you know Max and Ruby? It's the story of a bossy, yet caring, older bunny sister with an unpredictable and very silly little brother bunny. The only clear difference between Max and Ruby and my two charges is that Max and Ruby are rabbits. Other than that, the distinction is fuzzy. Was I wrong to include that photo? Egads, it is unsightly. It didn't bother the under-12 year old party goers. They actually preferred Max's cake and specifically requested their own gummy worm. We won't dwell on that one. Let's dwell on this cake instead: This one is worth your time and attention. It's a fabulously light and fluffy buttermilk cake, filled with raspberries and cream and frosted with some pink tinted whipped cream. I wish I had a piece right now for breakfast. It so festive and purdy, just perfect for a special celebration. Make a wish, birthday girls! And don't bother wishing for time to slow down, because it doesn't work. Better just have another piece of cake and enjoy it all while you can! Money Saving Tips: Cheat and use a cake mix here, pepped up with buttermilk and real butter. A cake mix on sale will cost roughly a dollar. Get your raspberries on sale or from Costco, or use frozen. Prepare cake mix according to package directions, substituting softened butter for the oil, and buttermilk for the water. Bake in 2 nine inch cake pans. Cool completely. Whip cream in mixer until just fluffy and gently add in powdered sugar and vanilla. (Put in a few drops of red food coloring for pink frosting.) Place one cake layer on stand. Frost with whipped cream and top with berries. Sprinkle berries with granulated sugar. Top with remaining layer cake. Frost entire cake with pink whipped cream. Add sprinkles if desired. If those aren't the cutest little birthday angels ever! How fun to have a cousin birthday party. I'm telling ya, yours is one FUN house! And I can't believe you have an 8 year old at your house. Such a special age. Happy Birthday Sailor. Loved the two different cake ideas. Worms Rock! 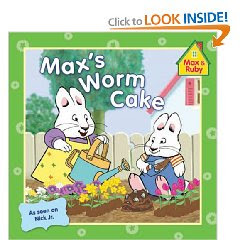 I...um, the kids love Max & Ruby so we've seen the raspberry / dirt & worm cake episodes & I think you did a terrific reproduction job! This is darling! We know Max & Ruby a little too well at our house. My kids would flip over these cakes! Happy Birthday to your sweet little girl! You are so right - it almost take my breath away at how fast the years seem to go by once you have children. I LOVE your Max & Ruby cakes! 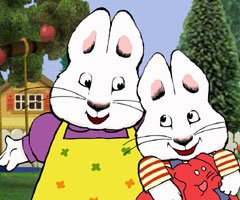 We love Max and Ruby around here - Ruby really IS bossy, but she is never mean to Max; therefore, I am constantly reminding my older ones to "be more like Ruby." The cakes look great! Such pretty pictures and a pretty cake....looks delicious! That is an adorable idea! We love Max and Ruby in our house. I have two more little ones to offer a raspberry fluff cake to, thanks for the inspiration. Your daughter is precious. Looks like she had a very happy birthday. The fluff cake looks good. Chocolate cake looks good too except you can leave off the worms for my piece. How adorable! Love the theme cakes! I think both cakes look super yummy! Also, every time I see a picture of Catherine's little girl I am amazed at how much she looks like my mom as a little girl. It's crazy! I can't believe your Sailor girl is 8 years old either! But I'm also having a hard time swallowing the fact that my littl miss is almost four! I would like to destroy all of our clocks and calendars too! Thanks for making the delicious and darling cakes for the party. We knew you were the right girl for the job! Was her birthday yesterday? That's my next to youngest son's birthday, too! Happy birthday to your little princess, and I'll shed a few tears of bittersweet joy with you at the passage of time. I don't understand why people think being "empty nesters" is so wonderful; to me, life is just becoming more empty when they aren't all around. The Max & Ruby birthday party was a grand idea! So cute. I know Max & Ruby well...and my kids would love those cakes!! Great job and happy birthday to your little girl! A hearty happy birthday to your daughter and hugs for you, Erin. That decade will fly by so treasure all the moments. What a fun party! How lucky to have so many cousins and birthdays so close to celebrate. I love the theme. Both cakes look delicious. Just perfect! I love it! And how precious are those girlies??? What a cute idea! I love the Max and Ruby idea. Those cakes are perfect! i have to admit that raspberry fluff cake never sounds good to me when we read the book (over and over and over)but this one looks fab. it will be just the thing for our new baby's birthday cake next month--if i can wait to make it that long. we are big max and ruby fans . . . and max's mud cake with red hot marshmallow squirters and worms looks yummy, too, even to this over-12-year old. Elise (my almost 4 yo) just declared that she is having a Max & Ruby party too! Thanks for the recipes and idea! EEEEEEEEEEEEEEEEEEEEEEEEEEEEEEEEEEEEEEEEEEEEEEEEEEEEEE ~ that's from elise. She really likes E's. adorable idea, adorable cakes and adorable girls. i made this cake for bronwen's birthday. i used a french vanilla cake mix and added 1/2 cup butter, 1 cup milk, and 4 eggs to achieve a pound cake-like consistency. the whipped cream and raspberries with it were phenomenal. thanks for the great idea. Nice cakes! Best attraction for kids and of course their excitement can be clearly seen in the pictures. Special celebration of baptism eve of my nephew is on cards next month. We are planning a traditional ceremony and lunch at rental spaces for parties near our place. Hunting for caterers and bakers. Sweet providers and gifts for guests are also to be done.